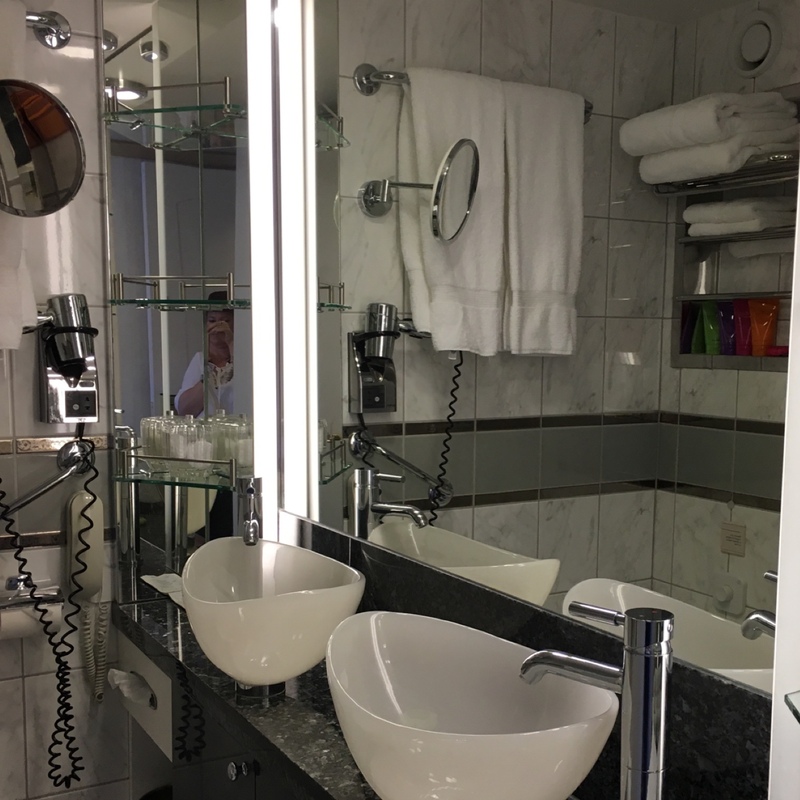 The ship was beautifully maintained, and the staff was well trained. We recently sailed on the Symphony and had a wonderful experience. From the moment we embarked the staff was so friendly and helpful. The amenities in the cabin were great. The good is exceptional,in the dining room, deck restaurants and the specialty restaurants. Disembarkation was smooth. The ship is fantastic. The food is great, the spa is very well done, the shops cover the bases, the casino is a good distraction on sea days, the pools and decks are nice. Except for our cabin which was filthy when we walked in with black marks all over the carpet and things on the floor like an open pin, candies, pieces of pens, etc. 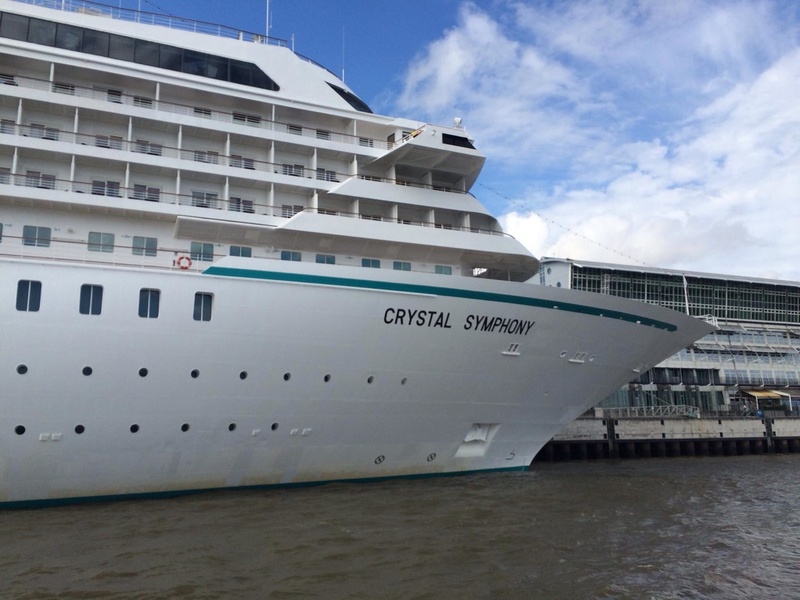 we thought the Crystal Symphony was a very beautiful and well maintained ship in all aspects. We were wowed by the service level, food quality and efficient operations of the ship. We were celebrating our 25th wedding anniversary and wanted a top of the line trip. We have cruised Celebrity, RC, Costa and Carnival. Crystal exceeded our very high expectations and it will be tough to travel any other line from now on. From champagne on boarding to the Bellinis served when we were approaching Venice, this line knows how to pamper their guests. We enjoyed the upscale crowd, and were relieved that it was not a stuffy group. There was only one formal night, which was fine for us. There were few tattoos and body piercings, and more wine and martinis than beer on this ship. The Bistro with complementary espresso drinks hot and cold all day was great. It offered food throughout the day, which we took advantage of. We would pop in for a quick breakfast or a snack after getting back on board after a port. The continuous smoked salmon, and Prosciutto and melon was a nice treat for a quick snack. Our only letdown was that the entertainment was mediocre at best. We opted for drinks rather than the show on a few nights. Dining at the specialty restaurants was fabulous. embarkation was a breeze. We just walked through the lounge, stopped at the table, got our boarding cards nd picture taken, then we were on board. No lines, no waiting. We were met by stewards with champagne. Nice start. The rest of the cruise was high class all the way. Minimal waiting in the dining venues, but that was it. When we tendered, we walked out and straight onto a tender. Again, no waiting. Tender pulled out when another tender pulled up, no waiting for it to be full. Food was fabulous! Entertainment was five star. Everyone from the captain on down was friendly and attentive. One of the best cruises ever. I am comparing this cruise with Crystal with a 5.5 star transatlantic with a Celebrity Reflection Aqua class cruise I took. The linens and cleanliness is comparable, but on board the difference between 5.5 and 6 star is very evident! The front desk and excursion staff never got short or exasperated with passengers. The staff uniforms were crisp. It is smaller than Celebrity, but I found I actually liked that, as it was never crowded. There was always a place to get a great view for photos of the glaciers. The caliber of passenger etiquette made a huge difference. There was never anyone reaching over you at the buffet line. People were polite and friendly. As a solo woman traveler, I found it very very comfortable. Easy to meet people or stay solitary. Whatever you do in Alaska, DO NOT MISS the float plane experience! My hands down favorite excursion was Misty Fjords, where we flew over snow covered peaks, across glaciers, and landing in a high mountain lake. I got to stand outside on the pontoon! TIP: try to be the last one on board and he will make you the co-captain and you will sit in the front with the pilot!!! 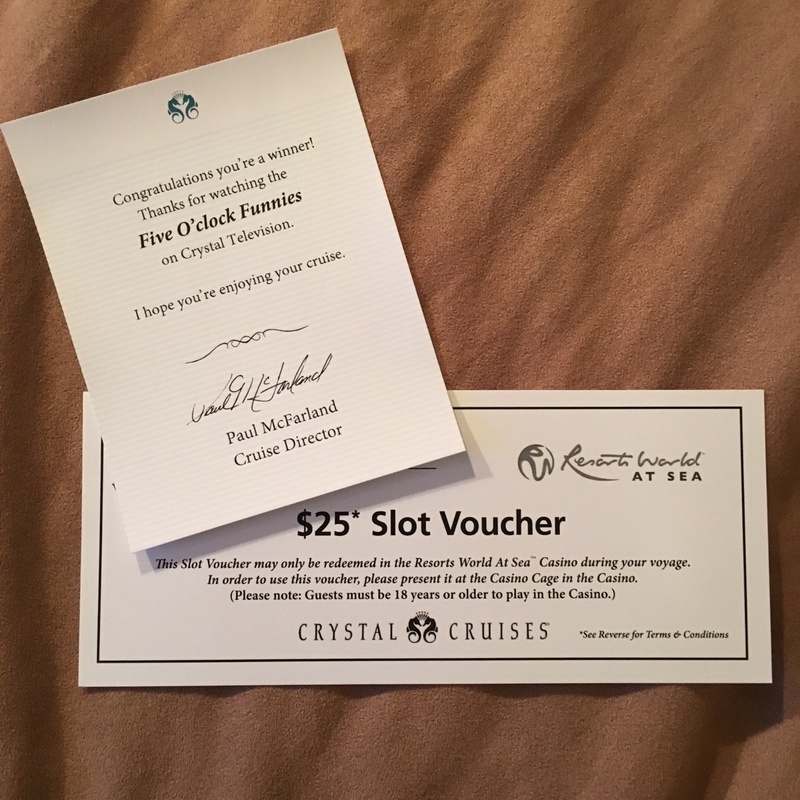 I cannot say anything bad about this Crystal cruise because it was so perfect, which is unusual. The Crystal staff is not overworked and pushed to exhaustion as other cruise lines do. They are well rested, go on shore and absolutely love working for Crystal which...actually enhances a passengers on board experience. I felt like an honored guest on this cruise. Now they have “open seating”. TIP: Book your specialty restaurant dinners way in advance! Crystal has a huge following of repeat customers who know to book UMA UMA quickly. If you wait until you are on board you won’t get in. Their SeaBass was extraordinary!!!! ( to die for!!!) Passengers get to dine once in each specialty restaurant free of charge. Additional dining is inexpensive. But the MAIN DINING ROOM is very beautiful with 10 star service. The food was fabulous! Also my favorite was the Brazilian steakhouse with favorite meat being the “short rib” which is not s rib, but a medallion of beef. All the lamb, steak, chicken, shrimp you can eat. Plus delicious creamed spinach, one of my favorite meals. Being a solo woman traveler I was very comfortable. You make friends in the excursions. My advice to anyone considering this cruise is take as many excursions as you can. Do not be frightened by helicopter landing on a glacier! These are experienced companies with good new equipment and... it is a lifetime memory. It would be a shame to miss the helicopter or flight plane! (My favorite was the flight plane.) formal night was cancelled much to the disappointment of guests who went to great lengths to bring tuxedos and formal gowns. Dress on this Alaska cruise was far more casual than I expected on Crystal. Even at the high tea, where the staff wore misfitting Venetian costumes, passengers were still in their excursion clothing, including tennis shoes. The fitness area is wonderful. They had treadmills that would incline which is my favorite. And there are full glass windows for views of the majestic mountains. I would do this exact cruise again and take different excursions. It was fabulous. Oh... additionally, disembarkation was beyond the best I’ve ever experienced. No loud speaker announcements. You are treated like a valued guest even after departure. All the way until you step out at the airport. It’s incredible that they have so many people on shore to make sure you are taken care of. We will not be booking further voyages with Crystal, for sure. We are on the World Cruise right now headed to Ft Lauderdale FL. As always the butler, service in the venues, food in dining room and cafe are wonderful!!! But there are now three Asian restaurants, which is not enough variety...we need German or Mexican or Irish Pub. The Italian is a fabulous break from the main diningroom. The new decor is now bkack, gray and white with glass and chrome -- which gives off a cold and unfriendly feeling. A far cry from the burgandy, na y and forest green with the cherry wood railings and trim that made it warm, comfortable and welcoming....more luxurious feeling. The entertainment is a lot of repeat shows although very good. Could use some new music...still same period of music just new songs. Enjoy the soft piano music as it invites conversation, but they have added some loud guitars which are not as much of a special feeling. So did not feel like coming home this time .... our with cruise. Overall our second experience on Crystal's Symphony somehow seem to lack the magic of our first experience. Whether due to having been one the ship before or something else we could not quite determine. We also experienced the strong odor of waste in the rear section of the 8th deck on two days and this was really disgusting. All members of our party also developed Upper Respiratory Infections either while aboard (1 person) and within 1-3 days of disembarking. This could have come from the flight over or from the ship. I believe its that latter and hope that somehow additional efforts can be made to reduce exposure. The ship offers some cabins with PURE air filtering and if we rebook on Crystal I will ask for a PURE cabin. Crystal is undergoing either problems or growing pains since a change in ownership early this year. Staff is wonderful and the trip and tours were great. However, there is needed ship upkeep and there have been significant cut backs in services since our Crystal cruise last year. Staff is somewhat stressed but great. Supposed room updates were non existent and the staterooms on the 9th deck are to be converted to penthouses so there will be limited space for those who do not want to pay penthouse prices. This is not the same outfit we traveled with last year and plan to look elsewhere until Crystal gets it's act together. Please see my commentary on the next portion of this cruise - Portsmouth to Stockholm. Our room was terrible on this portion of the cruise. Powers to be were not very helpful and a refund for our troubles was a spit in the ocean. Worn sofa, pee;ling surface of the bath tub when taking a bath etc. Housekeeping and wait staff were fantastic as well as the ports visited. If you choose to follow Crystal Symphony you will receive weekly email updates with the latest reviews, tips, and photos from Cruiseline.com members about Crystal Symphony.